Following a lengthy discussion about potential projects to benefit Green River Lake, the environment surrounding the lake, Green River and local communities, a group of 16 people voted unanimously to form the Friends of Green River Lake at a meeting Thursday, March 18 at the Green River Lake Visitors Center. — President - Scott Dillery. — Vice president - Melody Boward. — Secretary - Monica Thomas. — Treasurer - Shawn Canada. Now through April 10, most Kentucky households will receive a replacement 2010 Census questionnaire designed to increase Census mail participation, get a better count for the state and save taxpayers the higher cost of sending out Census takers to collect information. Campbellsville University student Nicholas A. Bertolucci of Cupertino, Calif. will display works for his senior at show March 29 through April 1 in the Art Gallery at 205 University Drive. "Life is surrounded by art that is undiscovered by the untrained naked eye," Bertolucci said. "I am an artist who uses what the city gives. My inspiration evolves slowly and subliminally to give me my themes. This tells me who I am." Bertolucci's exhibit consists of photography, acrylics, digital, spray paint and pen and ink. A Campbellsville man has been arrested and charged with using another person's debit card to make purchases without consent. Paul David Rucker, 36, of 940 Old Summersville Road was arrested Sunday, March 28 at 1:36 p.m. According to Rucker's arrest warrant, he is accused of using a woman's debit card last June without her permission to make $215.46 in purchases at local businesses. In another warrant, Rucker is accused of writing two checks to Papa John's, knowing that they wouldn't be honored. E.ON U.S. has unveiled an online outage map system that will relay outage information to its customers and the general public. Hosted on www.eon-us.com, the new map will show near real-time outages across the service territories of the E.ON U.S. subsidiaries, Kentucky Utilities Co., Louisville Gas and Electric Co. and Old Dominion Power. The map will be a permanent fixture on the site, offering outage information year-round. A Campbellsville man has been charged with second-degree burglary in an indictment recently unsealed by a Taylor Circuit Court judge. A grand jury may seal an indictment if there is a possibility that the accused will try to evade police. Indicted was Roger D. Dotson, 25, of 9489 Saloma Road. Bond was set at $25,000 cash. If convicted, Dotson could be sentenced to as much as 10 years in prison. - An indictment is a legal accusation only. It does not establish guilt. Nominations are being sought for the 2010 Excellence in Entrepreneurship Awards. These awards seek to celebrate success in entrepreneurship by recognizing businesspeople and entrepreneurs in 55 Kentucky counties — including Taylor County — who have created and are managing a successful enterprise. A Campbellsville man accused of leading police on a chase in February has been indicted on charges stemming from the incident. Damiamo Romonda Brown, 23, of 703 N. Columbia Ave. was indicted last Tuesday by a Taylor County grand jury. He was charged with first-degree fleeing or evading police, theft by unlawful taking more than $500, four counts of first-degree wanton endangerment, resisting arrest and driving on a suspended or revoked operator's license. The charges stem from a Monday, Feb. 22 incident. It's a sure sign that spring is here. With the May Primary approaching, campaign signs are sprouting as fast as spring flowers, and officials are laying down the dos and don'ts. State, city and county officials say that signs cannot block drivers' line of sight or hinder maintenance crews. Signs also can't be placed on public property, such as Miller Park. 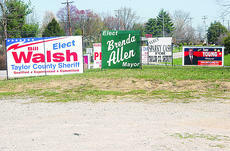 And with the large number of candidates seeking office this year, officials expect to see more signs than usual. 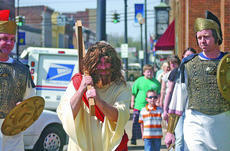 As part of First United Methodist Church's Good Friday service, church members portraying Jesus and two Roman soldiers walked from the intersection of Main Street and South Columbia Avenue to the church just before noon. Mark Hillard was Jesus and, Kyle Salsbury, left, and Chris Goodson portrayed soldiers. The procession was followed by a brief service at the church and a luncheon. The event is sponsored by the United Methodist Women and all proceeds will go toward their mission work.